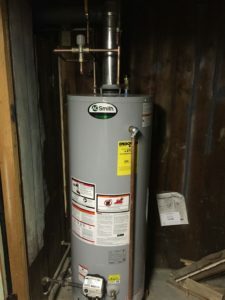 New A.O.Smith 50 gallon water tank replaced in Framingham. Our customer was having hot water problems and called us immediately. We sent our team out and found a defective water tank. The tank was replaced the same day. In almost all cases our technicians can diagnose and replace tanks the same day as visit. Call our office at 508-875-2593 to schedule service. Speak to Chris.